Now that the addition on the front of my house as been completed, I’m eager to get started on creating my new front garden, a big five-year project. But before I can begin digging and planting flower beds, I must first get hardscape in place. My planning for this project included a consultation with a landscape designer, and his design calls for a small patio and a network of walkways. I had hoped to have this work done by my contractor, but it has become a DIY project because there wasn’t enough money left in the construction budget to cover it. I wasn’t thrilled about having to do it myself; I find this fussy, tedious work, and I’m not very good at it. But I also know that it’s important to do it carefully and well. Fortunately, the crew who built the retaining walls that support the new patio did a great job laying out the hardscape areas by compacting the sandy soil and topping it with a layer of gravel. In addition, my contractor gave me some tips on how to do the work more quickly and efficiently. I’m using 1’ x 1’ concrete pavers for all of these hardscape areas. 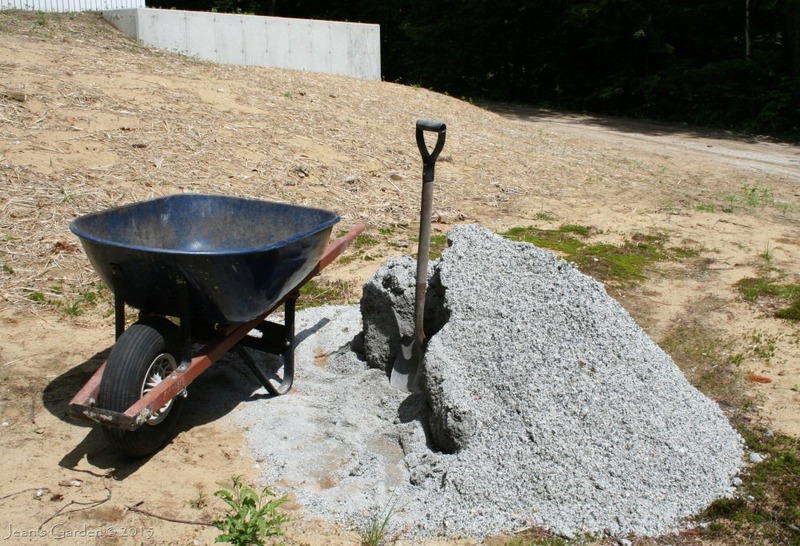 I began by having a cubic yard of stone dust delivered. I am using an inch of this as a base to lay the pavers in. Stone dust turns out to be very heavy, but I can move about 10 shovels-full at a time using my wheelbarrow. I began by laying the pavers (4 wide by 10 long) for the front walkway, and then moved on to spreading the base for the back walkway. As I began the walkway to the back door, I discovered a problem; it was 10’ 9” long. I would either need to cut some pavers to fit or fill in with another material. I decided to divide the pavers into three sections separated by narrow bands of pea stone. 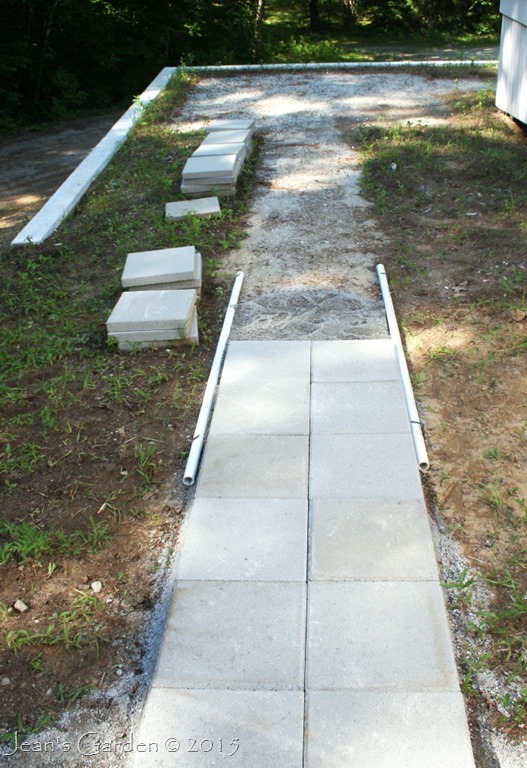 I also used pea stone along each side of the walkway. I like the way the contrasting materials look. In addition, the pea stone is very forgiving and could help me solve any problems in the way the two walkways lined up. 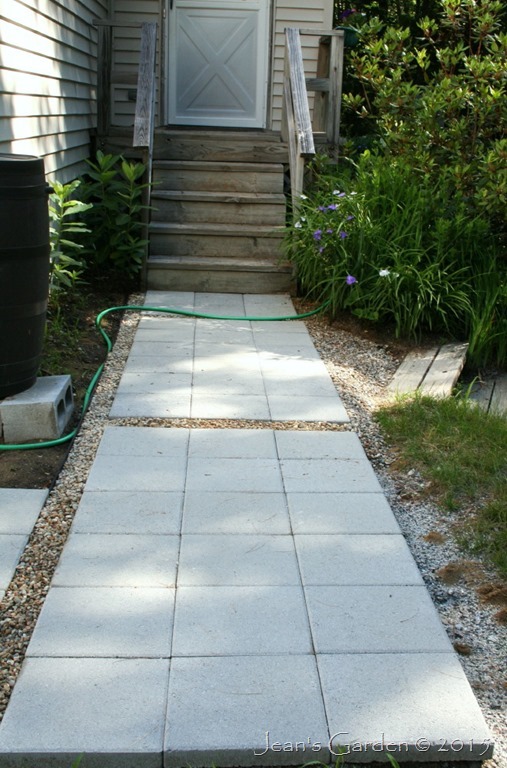 Moreover, this design also ties this hardscape to the walkway in my back garden, which is made of rectangular concrete pavers set in pea stone. When I had finished this second walkway, I realized that I was not happy with the way it connected to the front walkway. The perpendicular pavers did not line up with one another, and it looked messy. I also had some other dissatisfactions with the front walkway, which was not very level. 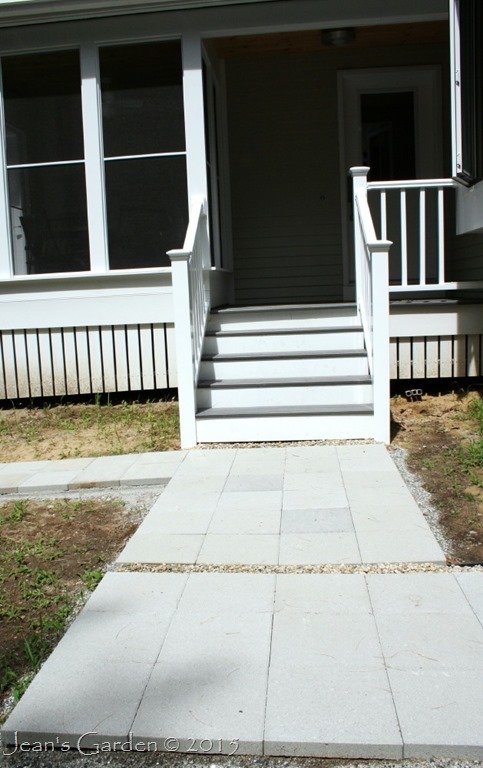 I decided to redo the front walkway by taking away one course of pavers, making the walkway a few inches shorter than 10’ and adding contrasting bands of pea stone at the intersection with the back walkway and at the base of the front stairs. 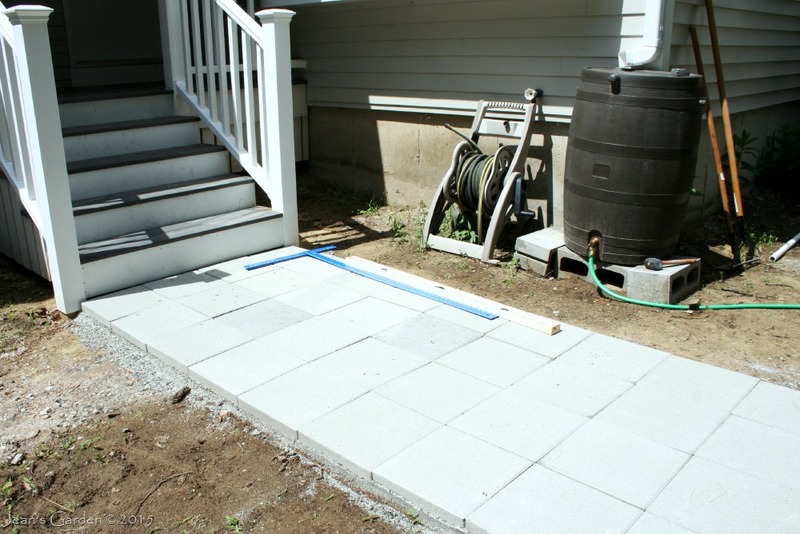 I’m much happier with this second version, and moving the pavers out a few inches from the base of the stairs made it possible to line them up properly with the 2’ wide walkway to the patio. I began the walkway to the patio earlier this week and expect to complete it this weekend. Then I’ll be ready to tackle the 8’ x 8’ patio. After that, there will be only one walkway left, which leads from the patio along the front of the house and will eventually connect with a grassy path leading to the lower part of the garden-to-be. Soon, I’ll be able to begin creating flower beds around all this hardscape! You never cease to amaze and inspire me Jean….this is quite a job you are doing and I know you cannot wait until that garden can go in…well done! Donna, This is the legacy of almost 4 decades living alone — the sense that if something needs to get done, I need to learn how to do it and get to work. I’m going to take a break from paving stones this week to get the first (very small) flower bed done. That is a change of pace that I’m very much looking forward to. I am so impressed. You have taken on such a big project so matter of factly and actually gotten a large portion of it done. I am not sure that I would have the patience. Carolyn, Thanks in part to my contractor’s tips, I’m much better at this than I was when I created the walkway in the back garden, which took me several years of summer work. This is a much bigger project, but it will get done in less than two months. Wanting to get 5 small flower beds around the hardscape dug and planted this year has been strong motivation to get started and keep going! You must be exhausted. What a big job, and what energy you must have to get it done so quickly. I like the way you solved the problems with pea gravel. Pat, I’ve been pacing myself on this, working on it only 2 hours at a time and doing only 3-4 of those two-hour stints in a week. Two hours is enough time to make noticeable progress (12 pavers) but not enough to leave me exhausted. I have now finished with the walkway to the patio and am envisioning two weeks of work for the patio and one week for the last walkway. We’re looking to do something very similar with pavers around our raised beds. With all the insane rain we’ve been having, it’s a mud pit! Not good. My awesome neighbor is in construction and he got some pavers when he did a concrete job. He gave them to me for free, seemed happy to get them out of his yard. Big win. That’s a neighbor to cherish! I’ve been paying $2 each for the pavers, so free pavers is a real gift. And I bet he’d also be willing to give you any advice you might need as you install them. Good luck with your project. I can appreciate the work that goes into a project like this. Workmen just put it down easily. We gardeners go through travail and error until it works. Oh, your aching back! “Travail and error” — an inspired turn of phrase 🙂 It’s actually my knees, rather than my back, that are aching — but I can see the end of this project in sight. I’m awed. That is HARD work. Very satisfying to be able to get it just the way you want it. Diana, I’m my own “ungardener” 😉 I’m not sure I’ll get it just the way I want it (I’m just not good enough at this kind of precise manual work), but it’s good enough to satisfy me. I was thinking of your decision, slab by slab, of where the path goes. I’m really impressed you created your own walkway. The result is beautiful and much more interesting than the original design. Hooray for you! 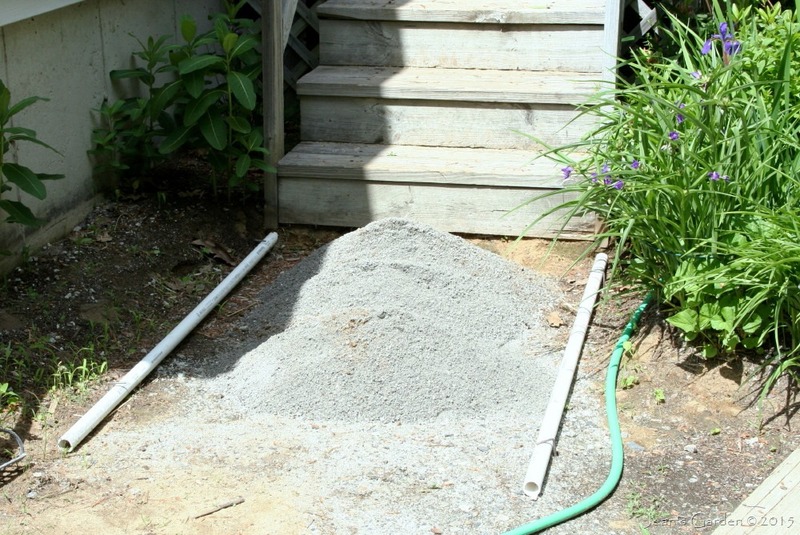 Tammy, Yesterday I finished the walkway to the patio and then swept sand into all the joint. I’m happy with the way it looks. Now on to the patio, which will be the most difficult part of the project. I’m very impressed by the work, your problem resolution process, and the finished (or partially finished) product. Use of the pea stone was a brilliant move – not only does it look good but it also improves the permeability of the walkways. Kris, I hadn’t thought about the permeability, so thanks for pointing it out. Because I live on a dirt road with neighbors who, like me, have gravel driveways, I don’t usually think about permeability as an issue. You’ve got some real determination and grit there. By the time you’re done you’ll be able to go down to the tavern and take on anyone for arm wrestling. Just remember, lift with the knees, not with the back. Looking forward to the finished hardscape and the new beds! Jason, I must be doing it right because it’s my knees, not my back, that are aching! 😉 One nice thing about being a gardener is that you can spend your money on plants instead of joining a gym. Good job! So many people fall apart at the start of these bigger projects and just want someone to finish for them. It just takes commitment and attention to detail and the right mindset. I love your design choices, the gravel mixed in really gives it a modern accent which matches the house. Bittster, One of my strengths is being able to break a big daunting project down into small manageable steps. (I’ve already broken this whole front garden project into five segments, each of which I can do in one year.) Thanks for pointing out that the pea stone accents give the walkways a more modern look. I hadn’t consciously thought that through, but modern is definitely my aesthetic. Jack, She who lives alone cannot be easily daunted or else nothing would ever get accomplished! 🙂 I’m really looking forward to pleasure more intense than that of having the contractors gone; that is a lot of pleasure!! Jean, this sounds so laborious, but you are doing a wonderful job! It seems the budget never quite stretches to cover everything. Sigh. But your walks look great, and when you add plantings, you will have such a tremendous sense of satisfaction to see your dreams coming to fruition. You have come so far! 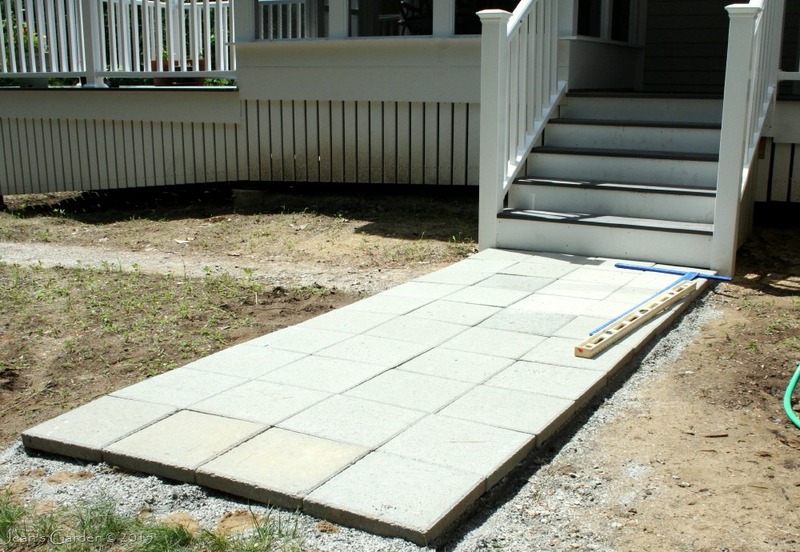 Deb, Aren’t you the woman who hand-painted all the segments of your stamped concrete walkway to look like flagstones? I don’t think this is more laborious than that. 🙂 I’m really looking forward to the adding plantings part. If I finish all this hardscape by the end of July (my plan), I can then dig and plant flowerbeds during the more fall-ish weather of August and September. Goodness Jean, that’s determination! I don’t think I could do such a paving job. I am very impressed given how many slabs you had to move and how heavy each one is. It’s always the case that the best job – planting – is the very last job, after all the ground work, hard landscaping, soil conditioning finally comes the planting – that will be a treat to savour and I can’t wait to read about it here!